Explore a witch’s curse, a creepy carnival, a haunted lighthouse and much more in this Ravenloft adventure by the sea. A review copy of “Widow’s Peak” was provided by the publisher. Find more DMs Guild Reviews on my website and YouTube channel. 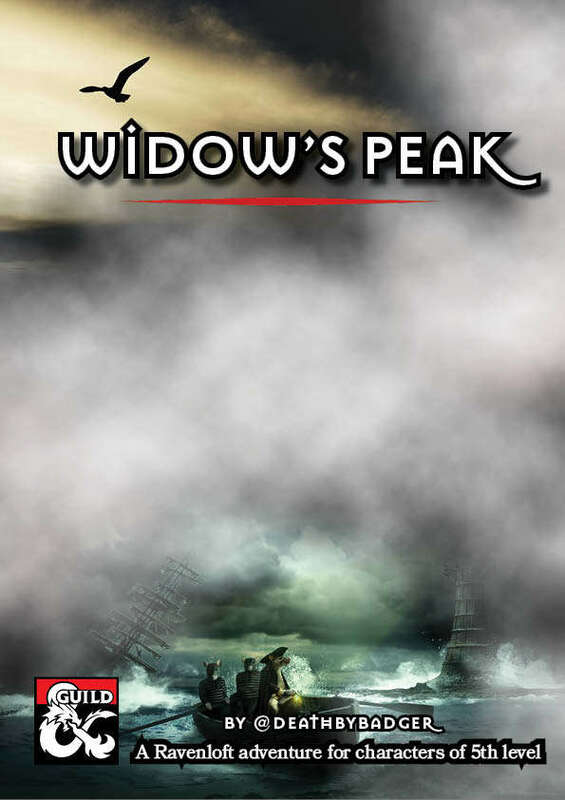 “Widow’s Peak” is a horror-themed adventure for 5th to 10th level characters. It takes place in its own demiplane within Ravenloft, which means you can get your party there by the usual misty teleportations – or even better, a misty teleportation when they’re on a boat. The horror theme combines with the fear of the sea quite well, and while there are lots of interesting, well-written locations to explore, the adventure lacks a solid overarching narrative. The 40+ page adventure is broken up into nine chapters, each depicting a different location within Craven Cove. The titular town provides a number of colorful NPCs to chat with, including the daughter of a local witch who was burned at the stake. Before she died the witch cursed the town to be barren, and now folks fear the witch has returned. The shocking twist, if you could call it that, is that the witch hasn’t actually returned at all. In fact it’s the townsfolk who are the evil assholes (most of them anyway) and have adopted a new cult of human sacrifice in the hopes of currying favor from a dark god to help save them. Much of the adventure is designed around exploring the many notable locations of Craven Coves, though the adventure gives little reason to explore them. In fact the only real quest is to break the witch’s curse, which they can’t ever accomplish. Fortunately all of the areas, including the many random encounters, are excellently written and interesting. None are huge dungeon crawls; instead we get tombs, caves, beaches, a lighthouse, and a rocky area full of shifting rocks and living statues. There are extensive backstories that bring each area and its denizens to life (or unlife), though the adventure lacks solid side quests or hooks to give the characters any reason to actually venture there, other than the witch’s cabin. The creepy carnival is a particularly interesting location where nothing actually happens, yet it’s still full of fascinating, richly drawn characters whom the party can interact with, and provide a respite from the dangers of traveling. The adventure can end whenever a DM decides to end it. The leader of the carnival is actually a Celestial, Isolde, and the party can meet her at the witch’s house, where she tells them to help her rid the area of the cult. There’s not much a party can contribute when a CR 21 Celestial’s involved, which can render much of the final area (a one-room cave full of cultists) moot. The ending climax gets a bit trickier, however. There’s an optional Corruption mechanic DMs can use to track player decisions. The person with the highest Corruption could be offered a job to be the new Darklord of this demiplane. Acceptance transforms that PC into a Kraken (!) which then fights the rest of the party (!!). Other options include turning Isolde evil with the same Darklord offer, or simply denying it altogether and letting the domain collapse on itself. That last option is still viable, creating a fun chase situation as the PCs race with Isolde toward the carnival to be spirited away, before the rampaging swarm of seagulls and possible Sharknado can get them. 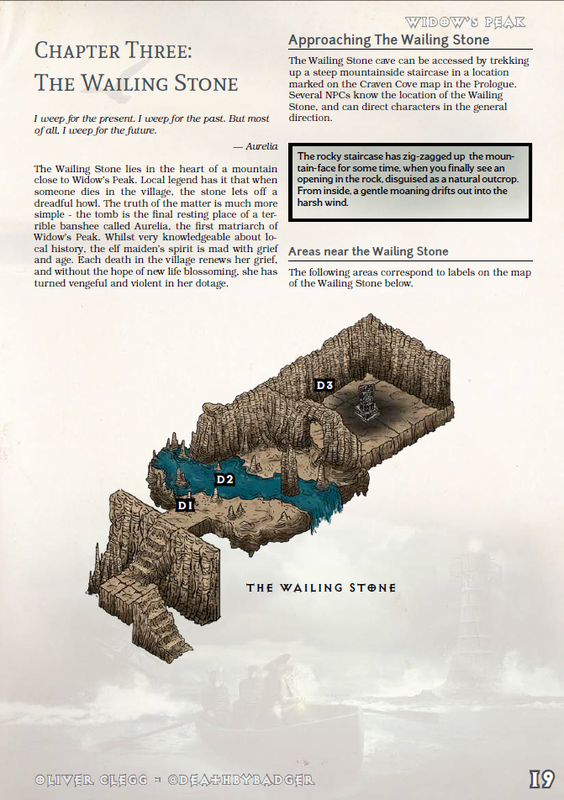 I like that “Widow’s Peak” avoids the usual graveyards and swamps in favor of craggy mountains and dark beaches, and the individual locations could all be easily pulled out and dropped into existing adventures – Curse of Strahd being an obvious choice. It fails to tell a compelling story by itself but puts enough pieces in play that a DM could certainly fill in the gaps to craft a grand, memorable seaside vacation. The writing throughout the adventure is evocative and immersive. Richly thematic random encounters that are more than just monster attacks. World map and isometric dungeon maps look fantastic. Several unique, interesting monster stat blocks, magic items, and new tables for more thematic trinkets and wild magic. A selection of suitably epic ending climaxes to choose from. No separate grid-based battle maps. More a series of locations and events than an overarching narrative. The Verdict: While it uses its fair share of classic horror tropes, “Widow’s Peak” breathes fresh salty sea air into the genre by providing a mini-world of horror to explore. Question for you: What widget are you using to show your boardgame plays from BGG? From here, https://www.boardgamegeek.com/geekwidget.php and added it as a custom HTML. I may have add to switch around a few settings to get it to display correctly.